…hey, that’s not a sea creature! 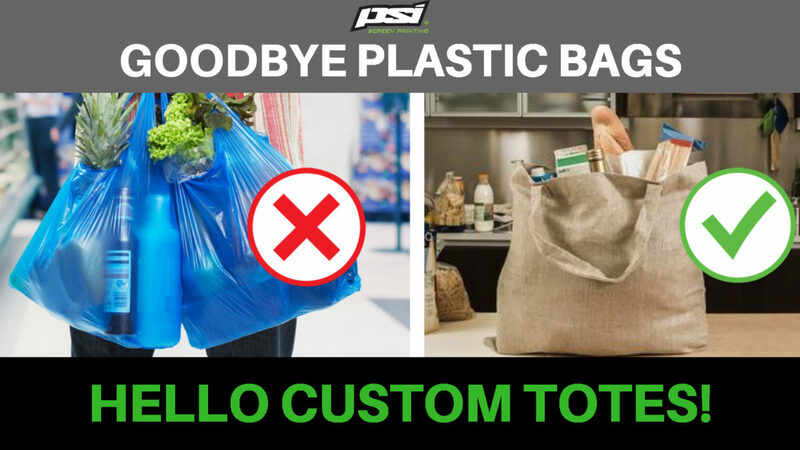 What this change means is that people all over the country have an ongoing need for high quality, reusable calico bags and canvas tote bags for everyday use. One thing is certain – your customers are going to buy tote bags, from somewhere, several times. 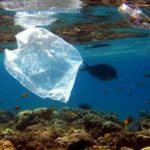 But instead of getting their re-usable calico bags from some corporate mega conglomerate, they’re better off buying their new eco shopping bag from YOU! Everywhere you look custom printed totes are now a natural part of society – at the gym, at the beach, the library, on the train, at work, hanging on the back of chairs at the pub, absolutely everywhere. That means when you create your own custom printed totes, your brand, your design, your message is more visible in the world around us on a regular basis. Want to look at giving your customers or members a branded gift item? Since you won’t have to project sizing, totes are the perfect addition to your custom apparel range! Now, one common misconception about totes is that you can just include a handful in your print run which you’ve already got set-up for t-shirts. When we screeenprint, we start by loading the t-shirt onto the board. A t-shirt has a hole at the BOTTOM, so your artwork is exposed onto the screen with that in mind. With your custom totes however, the hole of the bag is at the TOP, essentially meaning that the artwork needs to be set-up in the opposite direction (upside-down) in order for it to appear correctly on your bags. Here’s what another screenprinter had to say about it on FB the other day…. Along with that, depending on the size and shape of the bag, this might affect the exact location we need to expose the artwork on screen, so that it lands on the right spot of your bag. 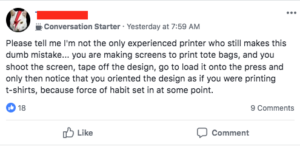 Don’t worry though, with our low production minimum of only 25 bags per design, your terrific tote design idea will easily qualify for a print run. Just like any normal print run, the volume you choose to print will have a pretty big affect on your overall per unit pricing, with bulk discounts kicking in at 50+, and the sweet spot really starts at the 100+ mark. So – a tote’s a tote, right? Here are a couple of pointers for you when working out which custom tote bag you want to add to your range. 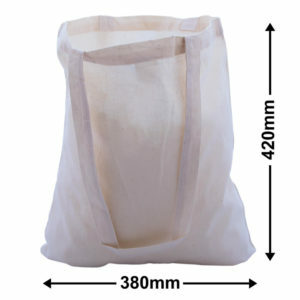 CALICO / CANVAS fabric is typically around 140gsm, this is your cost effective style of tote bag. Available in a few different shapes and sizes, this is by far the most popular style of tote bag that our clients love. Here’s an example of a popular low cost tote bag, it’s a great size for a variety of uses, with long handles to sling over the shoulder. COTTON DRILL on the other hand is a heavier, premium fabric option. around 320GSM, they feel a lot thicker and more robust. There’s definitely been a spike in the popularity of heavy weight, luxury tote bags which are made of a more robust and heavy cotton drill fabric. These premium style totes typically RETAIL for around $20-29 with print included. (That’s the price you’d charge your customers, not what it would cost you). 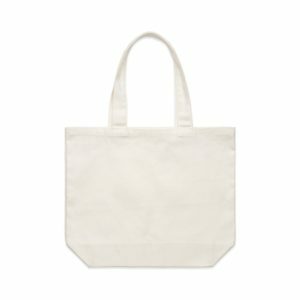 To give you an idea, AS Colour retail this Shoulder Tote BLANK (as in, not printed) for $15 each. So what are you looking at, pricing wise to make your own custom tote bags? We want to help YOU introduce custom totes as a staple in your custom apparel range. Just have a chat to one of our friendly Apparel Consultants and they’ll guide you through the right fit for your brand, and your budget. Give us a call on 1300 853 474 or click the button below to get in touch.